So far so good. 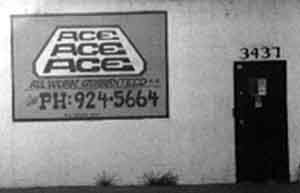 This sign, on the side of a building, tells us that whatever establishment is around the corner to the right is named "Ace." We still have no idea what products or services Ace provides, but when we get around the corner all will be revealed. It's a teaser. Can you imagine spending however much money these two signs cost and having them intentionally in the public eye for years without realizing you forgot to say what you sell? Maybe they sell good poker hands. Also, although you can't read it, at the bottom the signpainter has autographed his work with "O.W. Newberry D.B.A." That's it, just "D.B.A.," not "D.B.A. Heritage Signs" or some such thing. And if you look really close you can see he did leave room for the company name, but apparently he forgot to come back and fill it in. Finally, notice that on the first sign Mr. Newberry got the address wrong. In case you care, it turns out Ace is an auto body shop. Update of December 6, 2008: You'll just have to take my word for it that there is no other signage or any other indication whatsover on or near this building that even slightly suggests what Medina Brothers distributes, which I find particularly funny since they make a point of being open to the public. It's not like this store is one of many antiques dealers or art galleries in the same area, so that anyone wandering around would know what Medina Brothers distributes. In fact, it's pretty much the exact opposite. This part of town is not one where you would ever voluntarily wander around. This is a part of town you want to get past quickly to get someplace safer. 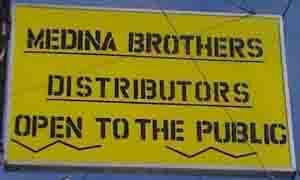 So I just can't imagine how anyone driving by would see this sign and say to herself, "Hey, I'm going to pull over and go to Medina Brothers. I need something -- I don't know what, but something -- distributed." Finally, what's the deal with the two zig-zags? They are neither plumb nor level, and they aren't centered. Did the Medina brothers pay extra for them?